One is writing this from the cool comfort of one's hill facing room at the homely Forest Guest House at Araku Valley. Araku Valley is a paradise for all those who love the sun, the mist, the clouds and the hills. The best part of getting to Araku Valley from Visakhapatnam is the train journey. Visakhapatnam is connected to Kirandul in Chhattisgarh falling under the East Coast Railway Zone. The train number is 58501 and this train is a passenger train. Rush to the station early, book your tickets on the spot and board the train to get a window seat. There is one first class compartment in the train for those who prefer first class. This train starts from Vishakapatnam at 6:50 a.m. sharp and arrives at Kirandul at 8:50 p.m. on the same day. The most picturesque part of the journey is from Vishakapatnam to Araku Station. This train reaches Araku Station at 10:40 a.m. Araku Valley forests are full of Silver Oak trees aiming to reach the skies. As the trees are arranged in concentric circles, one can go into a trance as one watches them fly past you in endless rows during the train journey. The train starts at 6: 50 a.m. and the journey through Marripalem, Simhachalam, Pendurti, Kottavalasa, Mallividu, Lakkavarapukota, Shrungavarapukota and Shivalingapuram is uneventful. However, as the train makes it way up the ghats from Shivalingapuram to Tyda, the landscape turns into several shades of green, from light to dark to deep green. Tyda is on the foothill of the Eastern Ghats and is home to many log-huts where one can stay and enjoy gentle treks through the surrounding forests. One can speak to the forest officers and obtain permission for pitching tents if interested in camping. One passes through 37 tunnels after crossing Tyda. This Railway line was started to transport Bauxite from the mineral rich states of Orissa and Chattisgarh to Visakhapatnam port. This train passes through south India's highest broad gauge station Similiguda which comes one just before Borra Caves. After Tyda, the train snakes its way through the Ghats offering airplane views of the hills and valleys. The slope is gentle and the journey is comfortable. The train does slow down before entering the tunnels, offering breathtaking views. The 36th tunnel is the longest and stretches to a distance of 1.2 km. As the train comes out of the pitch darkness of the tunnel, it is a simulation of flying over the hills as the train appears to be momentarily suspended over the skies. Though the journey from Visakhapatnam to Araku takes all of 4 hours, one wonders how time flew and within no time one has reached Araku Station. The journey has been shortened as the window of the train opens you to a new world. As one nears Araku, there is a nip in the air and the temperature decreases by a few degree Centigrade. Soon, one finds one head among the clouds and the greenery of the trees gives way to snow-white clouds. The mist hangs heavily on the valley and a few isolated showers add chill to the icy winds as they blow across one's face. The first glimpse of Araku Valley from the window of one's train has one hooked. It resembles a green emerald nestled in Nature's own palm. Araku Valley is home to the Paraja tribe who speak in a mixture of Odiya, Telugu and their tribal dialect. They are extremely hospitable and friendly to strangers. There are no major stations along the way, hence passengers are requested to take fruits with them, as the train has no pantry services. Tribal women sell bananas, peanuts and star-fruits inside the train, which is in great demand throughout the four hour journey. As the train winds its way through the ghats, it throws up pleasant surprises every passing moment. Suddenly a flash of red flowers sweeps through the skies and thousands of mustard flowers sway in the gentle breeze on the terraced farms. A minute later one finds several mountain streams and some short waterfalls cascading down the slopes. Every minute of the journey is an adventure, especially for amateur photographers who want picture postcard photographs.. At several points in one's journey, one can watch the complete train as it curves in a 180 degrees arc to enter the tunnel. One can watch the engine from the last compartment during such sharp turns on the way to Araku Valley. Trekking at Araku Valley is not only pleasurable but the steep inclines and long distances make it an exercise which burns calories and exercises all four limbs. 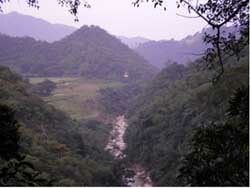 However, the cool environs of the hills ensures no perspiration and one is refreshed after the walk. Araku Valley is not a commercial hill station but a valley nestled in the Eastern Ghats which time forgot. Araku valley retains an old world charm and the tribals are full of wide happy smiles and go about their daily life with amazing simplicity, grace and honesty. The nearest international airport to reach Araku is at Hyderabad. There are several options for Indian tourists to get to Visakhapatnam from Hyderabad. By bus: The easiest way to get to Visakhapatnam from Hyderabad is by flight. Visakhapatnam is also connected to Chennai, Bhubaneshwar, Kolkata, Mumbai and New Delhi by direct flights. The other option to get from Hyderabad to Visakhapatnam is by bus. This 598 km. trip takes 12 hours. By train: The other way to get to Visakhapatnam from Hyderabad is by train. Train number 18310, Nagavalli Express leaves Secunderabad station at 10 p.m. and arrives at Visakhapatnam station at 10 a.m. and is an ideal overnight journey. All trains connecting Chennai with Kolkata and vice versa, pass through Visakhapatnam. Few small restaurants serving pure vegetarian Andhra cuisine dot Vishakhapatnam. Freshly steamed spinach with dal, served with Nellore rice boiled in an earthen pot, is a local dish which melts in the mouth. Boiled pumpkin with ginger and gongura leaves is served with boiled white rice at the pure vegetarian Andhra Mess located in Daba Gardens. Vegans should avoid the Andhra Thali, chillies and pickles (as they are acidic), but order only gongura dal, boiled rice and traditional spice powder (as they are alkaline). The food at the high profile restaurants is only for the gastronomically adventurous who like greasy food floating in oil. Fresh fruits including custard-apples, tender-coconuts, bananas and jack-fruits are available at the local market. The best custard-apples in Asia are sold by the Banjara women who grow custard apples on the rocky hillocks that surround Hyderabad. Custard-apples are grown all over Andhra Pradesh. 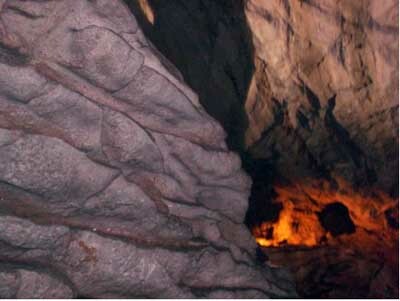 By train: The easiest way to get to Borra Caves from Visakhapatnam is by train. Take the Visakhapatnam-Kirandul passenger which leaves Visakhapatnam station at 6:50 a.m. and arrives at Borra Caves station at 10 a.m. and offers a picturesque journey through the Eastern Ghats. The train passes through 37 tunnels enroute. The Araku Valley Police Guest House is an ideal place to stay for Government Officers. For budget travellers homestays with locals is an option along with Railway Retiring Rooms. High end travellers and travel columnists can opt to stay at any Holiday Resort whose charges are equivalent to holiday resorts at Darjeeling, Oooty and Kodaikanal. At Visakhapatnam, the newly opened Novotel Varun Beach is located on R. K. Beach offers ocean facing rooms for high end customers who prefer luxury. * Do not litter or deface any cave. * Do not touch or damage cave formations. * Remember that the jagged edges of the caves are razor sharp. Do not touch them. * Do not carry any bags or luggage into the cave. * Take a source of light.